Interment will be private at St. Paul's Catholic Cemetery in Plainfield, Wisconsin. Please scroll down for visitation/service/memorial information and link to online directions to the service. Born to Eternal Life June 21, 2018, age 91 years; joining his beloved wife, Marie (nee Bushman) on what would have been their 66th wedding anniversary. Loving father of Diane (Gerard) Baumgartner, Kathleen Breiner, and Joe (Maureen) Breiner. Cherished grandfather of Ben (Kim), Becca, Andy, and Luke Baumgartner and JJ and Michael Breiner. Proud great-grandfather of Brandon and Alexis Baumgartner. Further survived by other relatives and friends. 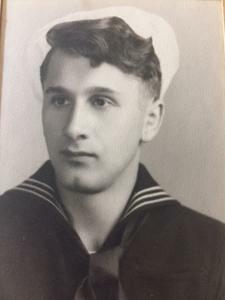 Joe proudly served as a Pharmacist's Mate in the Navy during WWII then worked for the Milwaukee County Dept. of Social Services for over 25 years. Special thanks to the caregivers at Columbia-St. Mary's Ozaukee Hospital and St. Anne's Salvatorian Campus. Visitation Thurs. June 28, 2018 at Our Lady of Good Hope Parish, 7152 N. 41st St. Milwaukee 9:30 AM until the time of the Funeral Mass at 11:00 AM. Private interment, St. Paul's Catholic Cemetery, Plainfield, WI. In lieu of flowers, memorials to Sisters of St. Joseph of Carondelet or Our Lady of Good Hope Parish, appreciated.